Steal the show this SS19 season with these slip on luxe beauties! 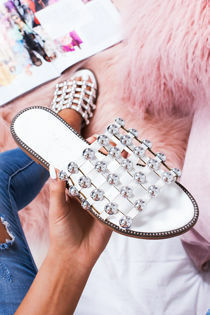 These super sassy slide on sandals feature lashings of statement silver studs and stud detailing to the edging of the sole. Rock these simple yet killa' sliders effortlessly and be the envy of every fashionista around. We’re styling these with ripped denim and a white shirt for an extra chic look this summer! Exchange / Return - We have to receive items for exchange/refund in its original, unworn, saleable condition by the 14th date from the dispatch date.